At each death time, the NPap value of each subject in the risk set is recalculated to reflect the actual number of papillomas at the given death time. For instance, subject one in the data set Tumor was in the risk sets at weeks 27 and 34; at week 27, the animal had no papilloma, while at week 34, it had five papillomas. Results of the analysis are shown in Output 64.7.1. After the number of papillomas is adjusted for, the dose effect of the tumor-promoting agent is not statistically significant. The output from PROC PHREG (not shown) is identical to Output 64.7.1 except for the "Summary of the Number of Event and Censored Values" table. The number of event observations remains unchanged between the two specifications of PROC PHREG, but the number of censored observations differs due to the splitting of each subject’s data into multiple observations for the counting process style of input. The plots of the DFBETA statistics are shown in Output 64.7.2 and Output 64.7.3. 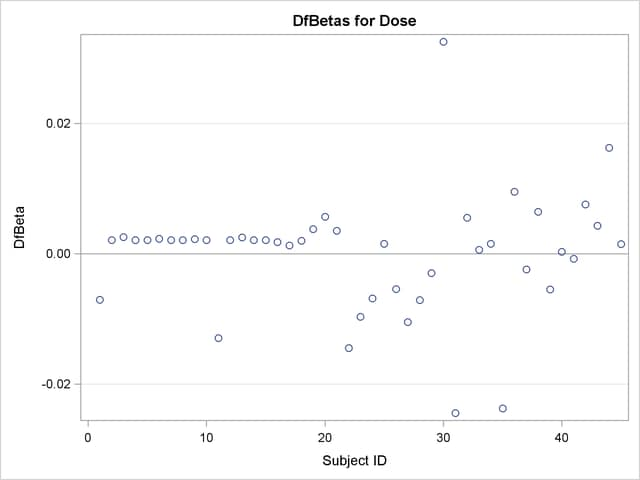 Subject 30 appears to have a large influence on both the Dose and NPap coefficients. 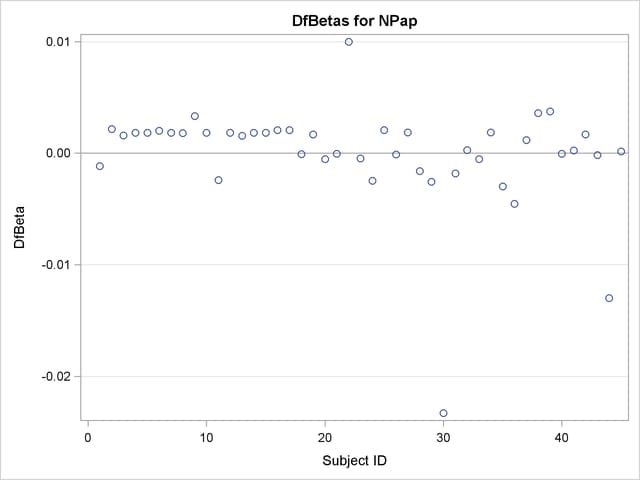 Subjects 31 and 35 have considerable influences on the DOSE coefficient, while subjects 22 and 44 have rather large influences on the NPap coefficient.